When Balaram went to the cowherd village of Nanda, the King of Karusha thinking that he is the son of Vasudeva sent a messenger to KrishnaWith glories of Krishna being sung about, Krishna was well established in everybody's mind as the son of Vasudeva. Paundraka was the king of Kashi. Emboldened by the flattery of childish courtiers Paundraka imagined himself to be Krishna the son of Vasudeva. So the foolish King sent a messenger to Lord Krishna. The messenger arrived in Dwaraka and conveyed the message to Krishna in the Royal assembly. He said,” I am the son of Vasudeva. The only one, who descended to this world, for showing mercy to the living beings. You give up your false designation. O Satvata !the symbols you carry out of ignorance do give them up and come to me for shelter, if not battle with me'. மறக்கும் பொழுது, என் முன்னே வரல் வேண்டும் வருந்தியுமே. அபிராமித் தாயே! சிறந்த தாமரையில் வீற்றிருக்கும் செல்வமே! என்னுடைய உயிருக்கும், உடலுக்கும் தொடர்பற்று, அறிவு மறதி மிகுந்து இருக்கும் வேளையில் உன்னுடைய சேவடி என்னுடைய சென்னியில் படர வேண்டும். மேலும், பற்றின்மையை அனுக்கிரகிக்கும் உன்னுடைய துணைவரும் வந்து மோன நிலையில் நான் அறிதுயிலில் அமரும் பேற்றை அருள வேண்டும். marakkum pozhudhu, en munne varal vendum varundhiyume. Mother Abhirami! Seated on the flawless lotus flower! 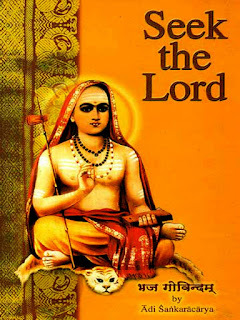 When my body and spirit are lying dissociated and when I am brimming with forgetfulness, your consort my Lord who grants renunciation and you together should manifest in front of me thus giving you the chance to place your feet on my head; both of you should grant be the tranquil state that make me meditate in peace. भगवान विष्णु के सहस्त्र नामों को गाते हुए उनके सुन्दर रूप का अनवरत ध्यान करो, सज्जनों के संग में अपने मन को लगाओ और गरीबों की अपने धन से सेवा करो. Royal and governmental favors, fulfillment of desires. Rukmini's son, Pradyumna, was kidnapped by Sambhara, And you killed Sambhara and returned back along with Rati Devi. Pradyumna was Kamadeva, reborn after being burnt to ashes by Lord Siva in anger. After kidnapping him on birth, Sambara threw him into the sea, where he was swallowed by a fish, which was caught by a fisherman and brought to Sambara's house. When cut open by Sambara's cook for making a dish for Sambara, Pradyumna came out of the belly of the fish and was secretly brought up by Rati who was then staying in Sambara's household and had recognized him as Kamadeva reborn. Pradyumna also carried away Rukmini's daughter, Rukmavati, (by her good fortune), who later bore him a son, who was the son of Pradyumna, Anirudha married Rochana who was the grand daughter of Rugmi, And you had attended this marriage and during this marriage, Balarama killed Rugmi after quarreling with him over gambling. 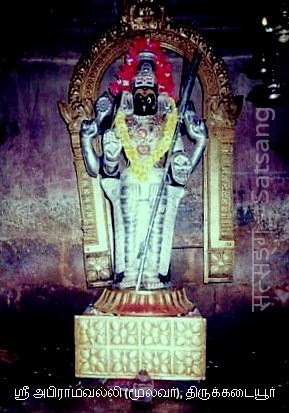 சிரம் ஒன்று செற்ற, கையான் இடப் பாகம் சிறந்தவளே. ஏ, அபிராமி! பகைவர்களது முப்புரத்தை எரிக்க மேருமலையை வில்லாகக் கொண்டவரும், திருமாலின் உந்தித் தாமரையில் தோன்றிய பிரம்மனின் சிரம் ஒன்றைக் கிள்ளியழித்தவருமான சிவபெருமானின் இடப்பாகத்தில் சிறந்து வீற்றிருப்பவளே! யாருமே துணையில்லாத நான், நீயே கதியென்று சரணடைந்தேன். ஆகையால் எளியோனாகிய என்னிடத்தில் உன் பக்தருக்குள்ள தரம் இல்லையென்று நீ தள்ளி விடுதல் தகாது. அது உன் அருளுக்கும் அறமன்று. siram onru serra, kaiyaan idap paagam sirandhavale! 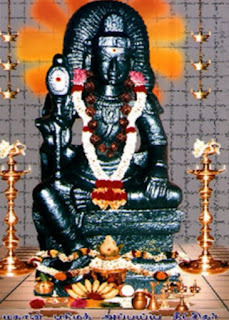 Hey Abhirami who has occupied the left side of my Lord Siva the destroyer of the three cities “ Thripuram” by wielding mount Meru as His bow and also plucking out the egoistic head of the the creator Brahma, I do not have any companion; I surrender unto you for protection; do not neglect me telling I do not deserve your protection which will not suit your graceful stature. काम, क्रोध, लोभ, मोह को छोड़ कर, स्वयं में स्थित होकर विचार करो कि मैं कौन हूँ, जो आत्म-ज्ञान से रहित मोहित व्यक्ति हैं वो बार-बार छिपे हुए इस संसार रूपी नरक में पड़ते हैं. Lord Krishna then marries five more ladies in different circumstances. He kills Narakasura in Pragjyothishpura and later goes to Indra Loka with Sathyabhama and as per her request fought with Indra and brought Parijatha plant to Dwaraka. And You also arranged Arjuna to get married to your sister Subhadra. Krishna always endeared the loving and very beautiful Satyabhaamaa. And along with her you attended the marriage of Panchali with Pandavas, And later according to the wishes of sons of Kunthi he stayed for some time, In Hasthinapur and Oh Lord! you having founded the city of Indraprastha for the Pandavas and then returned to Dwaraka. 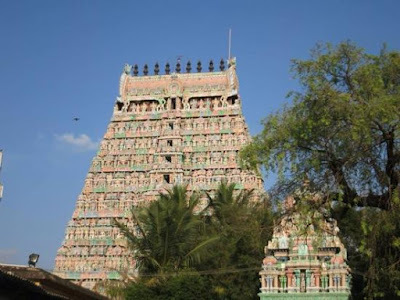 பழிக்கும்படி, ஒரு பாகம் கொண்டு ஆளும் பராபரையே. pazhikkumbadi, oru paagam kondu aalum paraabaraiye! Abhirami! You occupied the left half of My Lord Siva of steadfast penance, destroyer of Manmadhan with His forehead eye, thus making Him the laughing stock; you made your form, which is beyond words and mind, appear to my eyes and prayers. तुममें, मुझमें और अन्यत्र भी सर्वव्यापक विष्णु ही हैं, तुम व्यर्थ ही क्रोध करते हो, यदि तुम शाश्वत विष्णु पद को प्राप्त करना चाहते हो तो सर्वत्र समान चित्त वाले हो जाओ. Attainment of physical power, bodily ailments getting cured. There was a king of the name Satrajit, a Yadava nobleman. He was a great devotee of the Sun-god or Surya. Satrajit while walking along the sea shore was praying ardently to Sun-god. 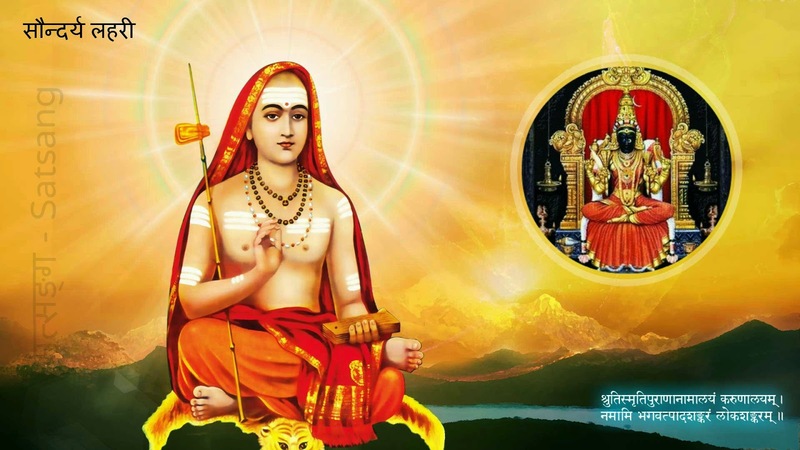 Sun-god pleased with Satrajit`s devotion himself appeared and stood before him and god awarded Satrajit as a blessing, the precious gemstone Syamantaka Mani. Satrajit later presented Syamantaka Mani to his brother Prasena, used to wear the gem often, and once while walking in the woods with it, he was attacked by a lion, which killed him and fled with the jewel. Then the lion was attacked by Jambavan, described as a `bear`, killed it after a fierce fight and took the Syamantaka jewel. பாலையும் தேனையும் பாகையும் போலும் பணிமொழியே. ஏ, அபிராமி! 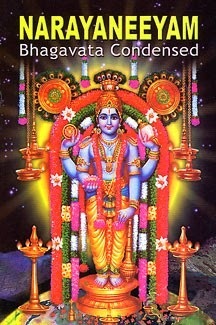 பாலையும், தேனையும், பாகையும் ஒத்த இனிய மொழியுடையவளே! யமன் கோபித்துப் பல கிளைகளைக் கொண்ட சூலத்தை என்மீது செலுத்தும்போது, திருமாலும், பிரம்மனும், வேதங்களும், வானவர்களும் தேடியும் காணாத திருப்பாதங்களையும் சங்கையணிந்த திருக்கரங்களையும் கொண்டு நீ என் முன்னே காட்சி தந்தருள வேண்டும். paalaiyum thenaiyum paagaiyum polum panimozhiye! Hey Abhirami! You speak sweet and soft word equivalent to the milk, honey and the jaggery syrup. When the Lord of Death, Yama throws the multipronged spear on me, you should appear in front of me with the conch adorning your hands and the feet, which are not traceable to Vishnu, Brahma and the Vedas!